Sun - Moon transit at 09:15 AM in the morning - Today tithi is Purnima. Moon is moving from Chitra Nakshatra. Moon is passing through Navamsa of Libra. Astrological Viewpoint - long term investment in blue chip companies. Stock Market Movement Analysis - The bulls will try their best to maintain an upper hand till 12 noon by showing buying interest in the stocks of Defence, Chemicals, Power & Paints sector companies thereafter the bears will take the matter in their hands. Precautions - It is recommended that Libra & Aquarius natives should avoid trading. AstroSage has brought stock market today predictions to help you understand astrological aspect of share market better. How bull and bear will get your shares? Will BSE sensex and NSE Nifty take a toll or get you high on wealth? How will be the share market today? Which stocks will rise up in BSE 500 index? Which shares will see a sharp fall in the market? Is it beneficial to invest in equity market? Such questions may be wandering around the perimeter of your mind and might be making you conscious regarding where, when and how to invest your valuable funds. Get a gist to all your questions with our Sensex Nifty Predictions for today with the information given below which is based on calculative precision of planetary movements. The planetary and Nakshatras movement will have a compelling influence on the stock market today. One may see fluctuations in the Nifty share price of various entities, shares and company’s stocks as well. Read this expertly calculated BSE Sensex and NSE Nifty specialised astrological analysis related to share market price. These astrological predictions will help you understand how planets influence market better. The stock market predictions are calculated by our esteemed Astrologer Rajeev K. Khattar, who is a well-known name in the field of Astrology. 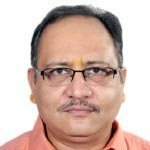 He has more than 20 years of experience in offering expert astrological predictions in the area of stock market and other finance related matters. Engineer Rajeev K. Khattar is a renowned name in astrology world and has studied several branches in this field. Among these, Lal Kitab, Krishnamurti System, Vastu Shastra, etc are prominent. Astrologer Rajeev is also well-familiarised with Numerology, Muhurat Shastra and Gemology. He is primarily efficient in providing predictions and counselling related to Finance and Legal matters. He predicts the possible impacts on Economy and Stock Market based on the movement of various planets. He also writes astrological columns regarding various ups and downs in Sensex Nifty market, on regular basis for various magazines and websites. NSE (National Stock Exchange) certified Technical Analyst Rajeev K. Khattar also provides coaching for essential Government examinations, investments and trading related to Stock Market. Disclaimer: These astrological inferences are neither an invitation nor a suggestion / recommendation to trade in the stock market. The author, the editor & the publisher will not be responsible for loss of any kind. Kindly do consult your registered & authorized financial advisor before making any investments.